A little drive on the . 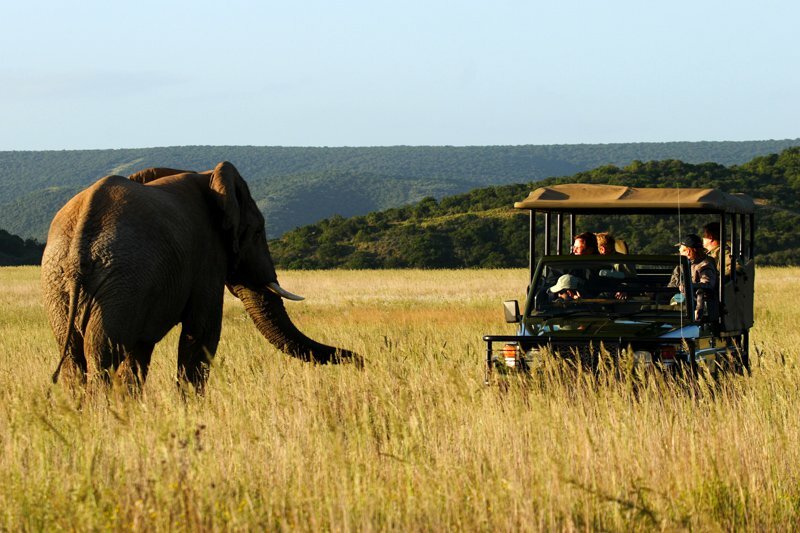 Photo courtesy of Shamwari Game Reserve. It's weekend. We caught up with Blue Ribbon Restaurants co-founder Bruce Bromberg about his latest trip. Bruce will be making appearances at the festival — and co-hosting a party with FATHOM at the Slice of the Cosmopolitan, home of the excellent Blue Ribbon Sushi. Was it your first time? No, I go two or three times a year. Why did you go? To see my wife's family. And we love it there. Who were you with? My wife, Kerry, and my three-year-old daughter, Tanner. How did you research the trip? I just went were I was told to go. What did you do? Traveled through Cape Town and visited family in Port Elizabeth on the Eastern Cape. This was especially great: Relaxing on the beach and swimming in the Indian Ocean. But this wasn't: The 27 hours of travel it takes to get there. Favorite meals: Lunch at in the Shamwari Game Reserve. There is nothing like drinking good wine and eating game after an early morning game drive. Favorite things you did: Game drive and relaxed with the family. One place you didn't get to visit, but wanted to: Really want to see , which stretches from New London to Durban. Next time. I brought back a couple of strange bug bites. They eventually went away. Where did you stay? With my in-laws. How did you get around? Sea kayak, bicycle, car, and boat. If you go back, what would you do differently? Stay longer. Too far for such a short trip. Would you go back? I have no choice!!! Any surprises? How fast a hippo can move if he is pissed off. Kodak moment? Descending a 300-foot tall sand dune near Jeffreys Bay to one of the wildest and most beautiful beaches I have ever seen. Unfortunately, I had to climb back up. Bruce is owner and chef of in New York and Las Vegas. He travels for the fun.